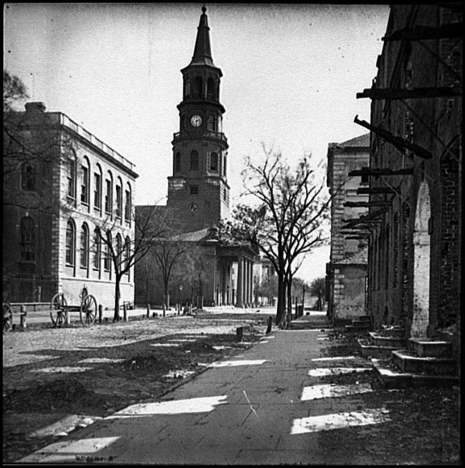 The Mayor of Charleston, South Carolina, surrendered control of the city to Union Brigadier General Alexander Schimmelfennig at 9 A.M. on Saturday, February 18, 1865. With commanding General William T. Sherman's arrival imminent, evacuation of the city began on February 17 and continued through the early morning hours of February 18. 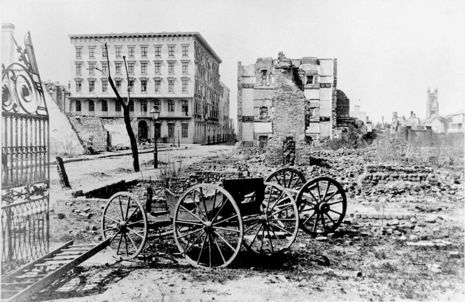 The city had been under siege since July 10, 1863. From the Nullification Crisis of 1832-33, to passage of the First Ordinance of Secession on December 20, 1860, South Carolina played a leading role in events leading up to the Civil War. Personified by John C. Calhoun, South Carolina's long-time senator, the state traditionally defended slavery and states rights. When Confederate troops attacked Ft. Sumter in Charleston Harbor in April 1861, few could have been surprised that events in South Carolina would push the nation over the brink and into civil war. As Gen. Sherman marched through South Carolina, the situation for Charleston became ever more precarious. On February 15, 1865, Gen. Beauregard ordered the evacuation of remaining Confederate forces. On February 18, the mayor surrendered the city to Union general Alexander Schimmelfennig; and Union troops finally moved into the city, taking control of many sites, such as the United States Arsenal (which the Confederate army had seized at the outbreak of the war).